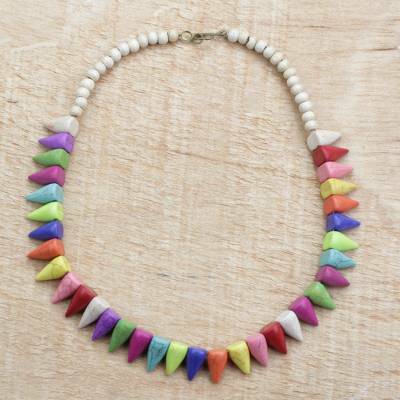 Rainbow Pointed Howlite and Sese Wood Beaded Necklace, "Rainbow Triangles"
Rita Addo Zakour takes inspiration from a bright rainbow when designing this stunning necklace. Multi-colored howlite triangles are paired with sese wood beads to create a bold statement. Pointed edges form a truly unique look that is ideal for a casual ensemble.